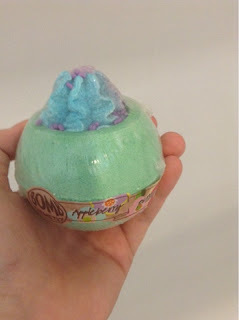 Loubee Lou Blogs: Bomb Cosmetics Bath Bombs. Today I bring you 2 reviews from my products that I ordered in my Bomb Cosmetics Haul. 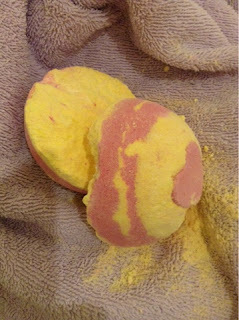 First up is the Rhubarb and Custard bath bomb. Now I had high expectations for this one because I absolutely love the sweets. I was hoping the bath bomb would be a replica of the delicious sweeties I love so much. To start, I always try and split the bath bombs in half so I get the most out of them. 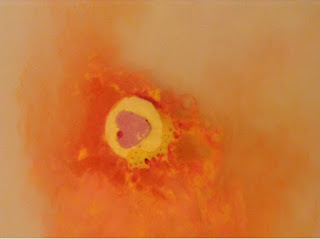 The bomb fizzed and released bright pink and yellow bursts. The colour eventually settled in this bright orange tone. 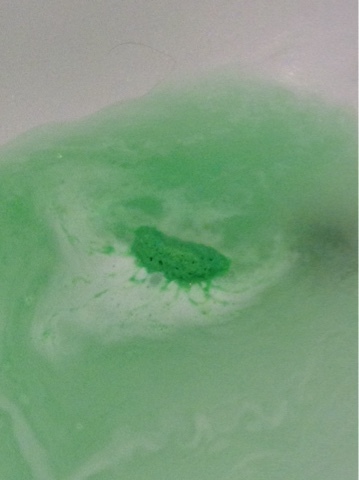 As the bomb fizzed the smell was divine. It was exactly what I hoped it would be. 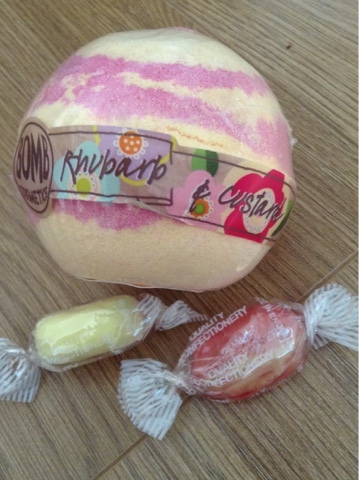 The typical classic rhubarb and custard smell. It was a smell that left a taste of nostalgia on my tongue. Bomb number 2 is the Apple Berry Butter Burst. This one has a silky core that does leave a coating on the water and around the bath so if you don't like that, this isn't for you. 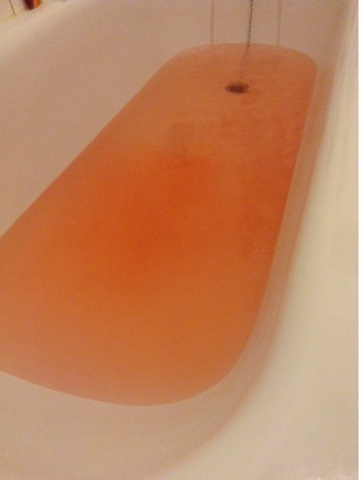 I did notice the bath was extra slippery too so be careful when using bombs like this one. This bomb dissolved really quickly releasing fruity, sweet notes as it did so. 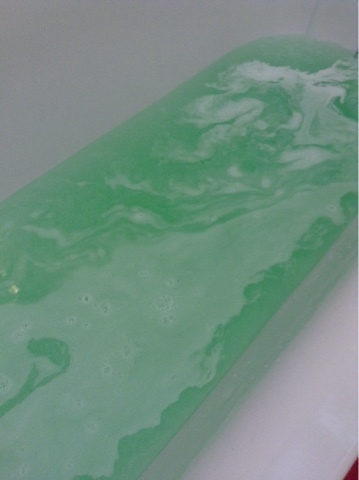 The bath was bright green with an awakening and bold scent. I found the bath really enjoyable and extremely nourishing. The body butter leaves the skin feeling super smooth and as if it has trapped in all the apple berry goodness. I felt like I had moisturised just by using this bomb and enjoyed the scent on my skin for hours after leaving the bath. 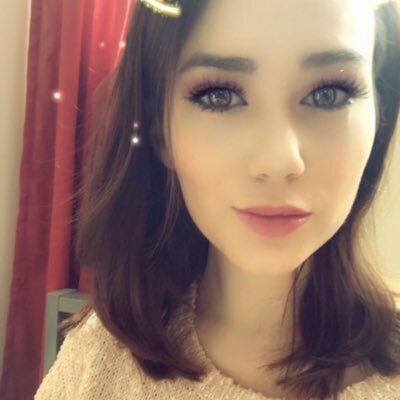 As always, I have enjoyed and loved every single product I have bought from Bomb Cosmetics so if you'd like to visit their website, I'd highly recommend it.